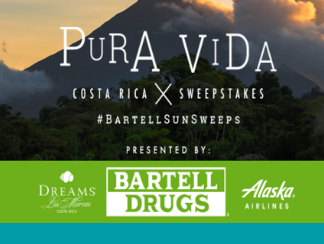 Bartell Drugs Pura Vida Sweepstakes – Win a trip to Costa Rica! Win a trip to Costa Rica! Open only to residents in Washington state in specific counties. ENTRY LIMIT – In the Sweepstakes each member of the Fan Program will receive one (1) entry into the Sweepstakes after earning one hundred (100) points during a single Participation Period. Earn points by sharing the sweepstakes, logging in daily, linking to social media, etc. You must sign up to be a Bartell’s fan to be eligible to enter. See how to earn more points here. SWEEPSTAKES ENTRY PERIOD – The Promotion begins on begins on March 6, 2016 at 12:00:01 a.m. Central Time (“CT”) and ends on April 6, 2016 at 11:59:59 p.m. CT.
PRIZES – One (1) First Place Sweepstakes Prize is available. One (1) winner (“Sweepstakes Prize Winner”) will receive a trip for him/herself and five (5) guests (guests must be at least eighteen (18) years of age at the time of Sweepstakes Prize Winner’s entry or be accompanied by an adult) (the “Guests”) to Dreams Las Mareas Resort & Spa in Playa El Jobo, Costa Rica (the “Trip Package”). Trip Package includes six (6) round-trip international coach airfare on Alaska Airlines for Sweepstakes Prize Winner and five (5) of his/her Guests from Seattle-Tacoma International Airport (SEA) to Daniel Oduber Quirós International Airport/Liberia Airport (LIR); (ii) accommodations for 5 (five) nights/6 (six) days (double occupancy suites) for Sweepstakes Prize Winner and his/her Guests including lodging for the Sweepstakes Prize Winner and his/her Guests . Sweepstakes Prize Winner will also receive a Bartell Drugs gift basket with an approximate value of $500.00. Total Approximate Retail Value (“ARV”) of Sweepstakes Prize is fourteen thousand eight hundred and eighty five dollars ($14,885.00). One (1) Second Place Sweepstakes Prize is available. The Sweepstakes Prize consists of a Bartell Drugs store gift card. The approximate retail value (“ARV”) of the Sweepstakes Prize is $500.